All nations, whether industrialized or developing, face a broad array of challenges that will require the application of up-to-date scientific knowledge and technology. Such challenges include mitigating environmental problems, safely adopting beneficial new technologies, and quickly responding to sudden outbreaks of new diseases. No nation can now afford to be without access to a credible, independent science and technology (S&T) research capacity that can help it to develop informed policies and take effective action in these and other areas, says a new report by the InterAcademy Council (IAC), an organization in Amsterdam created by 90 of the world’s science academies. 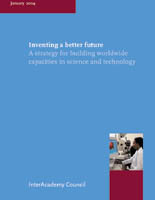 The report, Inventing a Better Future: A Strategy for Building Worldwide Capacities in Science and Technology, was presented to U.N. Secretary-General Kofi Annan in February 2004. The IAC study panel that drafted the report included experts from 11 different nations and was co-chaired by Jacob Palis, of Instituto Nacional de Matematica Pura e Aplicada, Rio de Janeiro, Brazil, and Ismail Serageldin, director, Bibliotheca Alexandrina, Alexandria, Egypt. “Inventing a Better Future delivers on the commitment that member academies have made to apply sound scientific knowledge and evidence-based principles to the critical issues that affect all nations: poverty, hunger, disease, the effects of globalization, and economic transformation,” said Bruce Alberts, IAC co-chair and president of the U.S. National Academy of Sciences. Enhancing local S&T capacity is essential, the report states, because trends in the development and use of new technologies have left a growing gap between “have” and “have not” nations. The world is experiencing a vicious cycle in which developing countries that lag in S&T capacity fall further behind, as industrialized nations with financial resources and a trained scientific work force exploit new knowledge and technologies more quickly and intensively. These deficits can leave entire developing economies behind. And when nations need to respond to diseases such as HIV or SARS, or make decisions about issues such as stem-cell research or genetically modified foods, this lack of S&T infrastructure can breed unfounded fear and social discord. The report asserts that there is no reason why, in an era in which air travel and the Internet already tightly interconnect national economies, S&T capacity building should not be a worldwide priority. Developing countries must begin strengthening their national capacities. “Given the current rate of change in science and technology, there is no time to waste if the majority of humanity is not to suffer further marginalization,” the report concludes. Page last modified 18 May 2004.